“White orchid tree” is an umbrella term that applies to several species of tree plants. Each has special characteristics that distinguish one from another. They are native to different places too, although today they grow in various parts of the world. What most of them share is the botanical surname, Bauhinia, after the Swiss brothers surnamed Bauhin, who were 16th century botanists. The white orchid tree called Bauhinia aculeata is a semi-evergreen tree that can grow to heights of about 30 feet, with a spread of up to about 25 feet. Its large, white, orchid-like flowers are about 3 to 4 inches wide, and profuse in the summer months. This tree’s branches develop in a pattern best described as twists and turns, usually ending in a downward twist. The dwarf white orchid tree or kaa-long snowy orchid (Bauhinia acuminata) is native to Malaysia. This small tree can grow as tall as 8 feet, flowering profusely from spring through winter. The five-petal blooms are highly fragrant. The dwarf white orchid tree usually does well in full sun to partial shade and good drainage. Bauhinia purpurea is a small white orchid tree that is native to the Pacific Islands and grows now in tropical America. A distinguishing characteristic of this tree is that its branches exhibit thorns. The white, orchid-like blooms are fragrant, usually flowering between September and November. This tree adapts to indoor life in a pot if pruned regularly and given sufficient light and warmth. 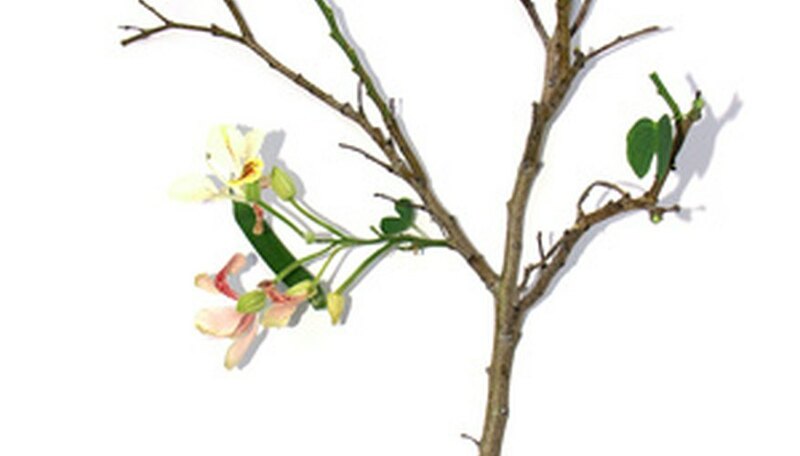 Fragrant white to pink orchid-like flowers characterize the Bauhinia lunarioides. This small, 6 to 12 foot tree with silvery gray bark goes by a number of other names, including anacacho orchid tree, anacacho Bauhinia and Texas plume. It is native to western central Texas and northeastern Mexico. It is a member of the Fabaceae or pea family. The Bauhinia monandra probably originated in Madagascar. Its white flowers bloom from winter through early spring. “Monandra” describes the single stamen of this species. Not a Bauhinia, but commonly called a white jade orchid tree is Michelia alba. It is an evergreen plant that is native to the Himalayas, and a member of the Magnoliaceae or magnolia family. The white jade orchid tree is among the more than 1,000 indigenous and sub-tropical species on show at The Hong Kong Zoological and Botanic Gardens. It is the city flower of Shanghai, China. Michelia oil provides the essence for Jean Patou’s “Joy” perfume.